Very young trees should be protected from cold but older trees are surprisingly hardy. Wilson Popenoe wrote that a large tree was killed on the west coast of Florida (about 7.5° lat. N) by a freeze in 1884. However, no cold damage was noted in South Florida following the low temperatures of the winter of 1957-1958 which had severe effects on many mango, avocado, lychee and lime trees. Dr. Henry Nehrling reported that a tamarind tree in his garden at Gotha, Florida, though damaged by freezes, always sprouted out again from the roots. In northwestern India, the tree grows well but the fruits do not ripen. Dry weather is important during the period of fruit development. 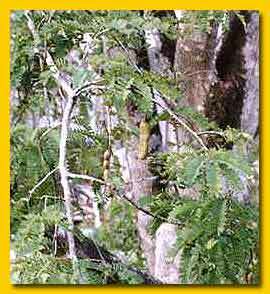 In South Malaya, where there are frequent rains at this time, the tamarind does not bear. The tree tolerates a great diversity of soil types, from deep alluvial soil to rocky land and porous, oolitic limestone. It withstands salt spray and can be planted fairly close to the seashore. Tamarind seeds remain viable for months, will germinate in a week after planting. In the past, propagation has been customarily by seed sown in position, with thorny branches protecting the young seedlings. However, today, young trees are usually grown in nurseries. And there is intensified interest in vegetative propagation of selected varieties because of the commercial potential of tamarind products. The tree can be grown easily from cuttings, or by shield-budding, side-veneer grafting, or air-layering. Nursery-grown trees are usually transplanted during the early rainy season. If kept until the second rainy season, the plants must be cut back and the taproot trimmed. Spacing may be 33 to 65 ft (10-20 m) between trees each way, depending on the fertility of the soil. With sufficient water and regular weeding, the seedlings will reach 2 ft (60 cm) the first year and 4 ft (120 cm) by the second year. In Madagascar, seedlings have begun to bear in the 4th year; in Mexico, usually in the 5th year; but in India, there may be a delay of 10 to 14 years before fruiting. The tree bears abundantly up to an age of 50-60 years or sometimes longer, then productivity declines, though it may live another 150 years. Mexican studies reveal that the fruits begin to dehydrate 203 days after fruit-set, losing approximately 1/2 moisture up to the stage of full ripeness, about 245 days from fruit-set. In Florida, Central America, and the West Indies, the flowers appear in summer, the green fruits are found in December and January and ripening takes place from April through June. In Hawaii the fruits ripen in late summer and fall.